The defensive play of Fernando Diaz (left) has helped Escondido win 11 straight. ESCONDIDO  Three weeks ago, Escondido’s Paul Baldwin made a major coaching decision. Instead of leading scorer Khy Kabellis guarding the opponent’s top scorer, Baldwin gave that assignment to Fernando Diaz and JD Fox. That decision has paid off in 11 straight wins, the latest victory 72-48 over Poway before a standing-room-only crowd Tuesday in the San Diego Section Division I basketball semifinals. The second-seeded Cougars (22-7) meet No. 1 Morse in Saturday’s 3 p.m. championship game at USD’s Jenny Craig Pavilion. Poway, which was making its first semifinal appearance since 1998, sees its season end at 18-13. “Fernando’s defense on Dalton Soffer was the key to the game,” said Kabellis, who led all scorers with 29 points and grabbed five rebounds. Soffer, who is headed to Seton Hall, still scored 19 points, hitting a trio of 3-pointers — all from long range. But he didn’t get a shot off in the game’s first five minutes and fouled out with 1:41 to play. “We didn’t want him to get any open looks,” said Diaz. “Coach asked me awhile back to defend the other team’s top scorer, and I took that as a challenge. 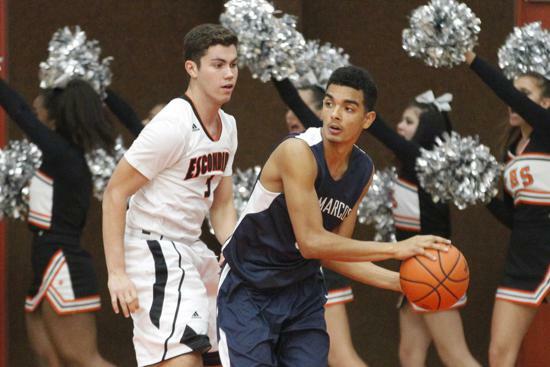 Escondido led 17-10 after the first quarter and 37-27 at the half with the help of a deep bench that included second-quarter scores from Andrew Dean and Marshall Daigle while 6-foot-10 Keegan Cummins was on the bench with three fouls. “Diaz did a fantastic job on Soffer,” Baldwin said. “Fernando is turning into a shutdown defender. Escondido outrebounded Poway 43-24 and forced 18 turnovers.